Weißpriach is a village in the Lungau area of Salzburg, in the south-eastern most corner of the province. Weißpriach has a total population of a staggering 300 and is situated just south of the Schladminger Tauern mountain range. The mountains of the area are particularly high, for example the Großes Gurpitscheck with 2,526 metres, or the Lungauer Kalkspitze with 2,471 metres. This has earned Weißpriach a reputation for excellent hiking and other Alpine summer sports. Apart from a bit of tourism, Weißpriach′s economy is shaped by agriculture and forestry. 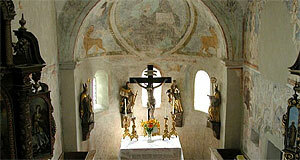 In terms of sightseeing, Weißpriach has something special to offer: The church of St. Rupert is a Romanesque building and one of the oldest churches in the province of Salzburg. It contains Byzantine style frescoes from the 11th and 12th century of exceptional quality and preservation. St. Ruprecht′s interiors contain a statue of St. Leonard, the patron saint of livestock, which was carved out of a single piece of wood - including the chain he is holding in his hand. Otherwise, just note the general prettiness of Weißpriach. It is a typical Alpine village, untouched by mass tourism and a good place to stay if you are up for some serious off-the-beaten-track hiking vacation in Austria. Weißpriach is connected with the bigger communities of the Lungau via roads and public busses. However, since you will probably want to see a bit more of the region, we recommend Weißpriach primarily to those that have a car.